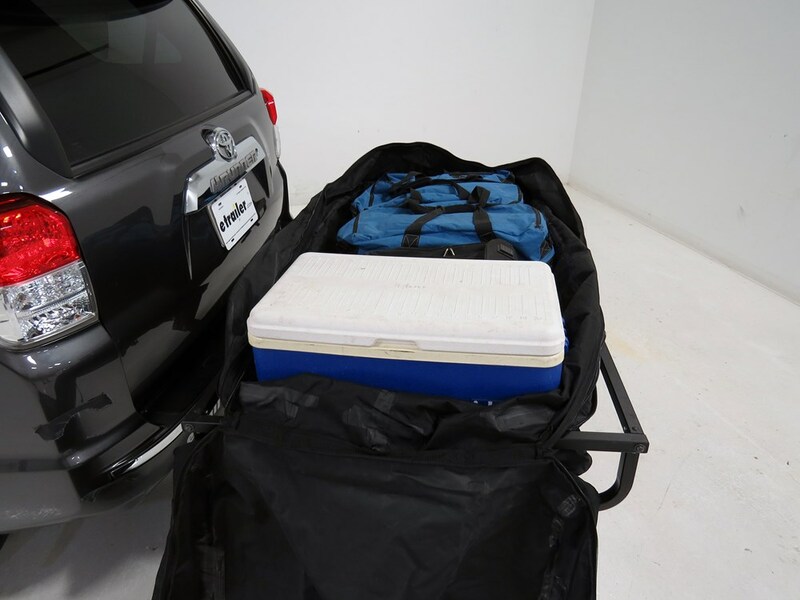 Durable cargo bag fits perfectly into your 48" long GearCage hitch-mounted cargo carrier. Heavy-duty PVC-coated nylon, sealed seams, and storm flaps over zippers shield your gear from the elements. Compression straps and tie-downs included. 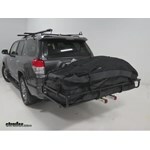 Call 800-298-8924 to order Lets Go Aero hitch cargo carrier bag part number HCR628 or order online at etrailer.com. Free expert support on all Lets Go Aero products. Guaranteed Lowest Price and Fastest Shipping for GearBag 4 Cargo Bag for GearCage4 - Water Resistant - 20 cu ft - 48" x 32" x 26". 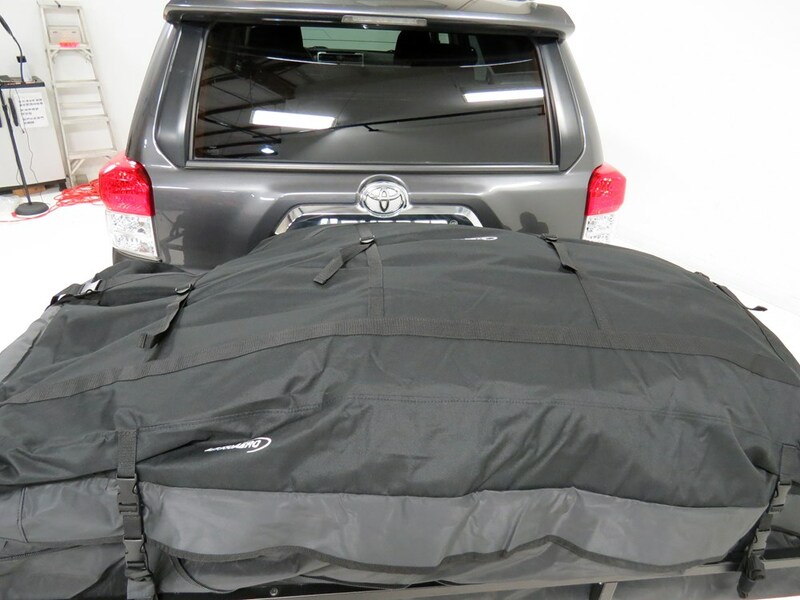 Hitch Cargo Carrier Bag reviews from real customers. 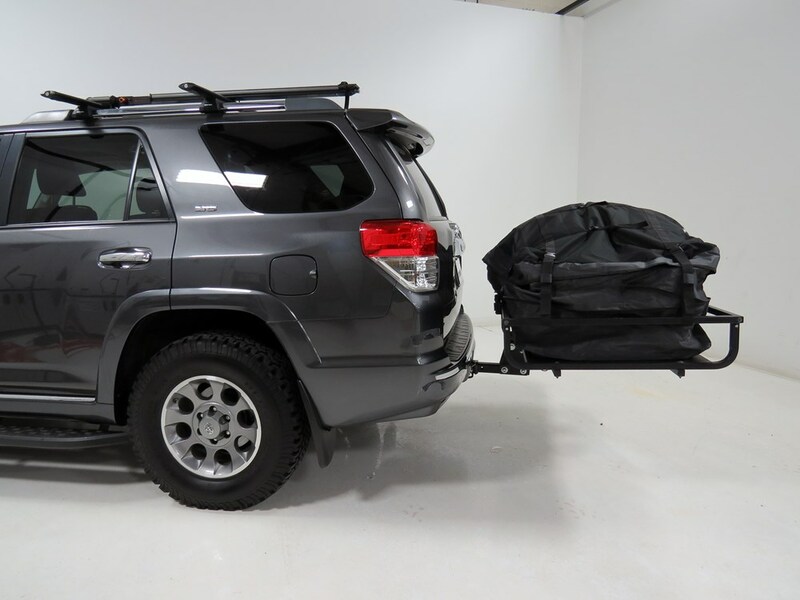 Durable cargo bag fits perfectly into your 48" long GearCage hitch-mounted cargo carrier. Heavy-duty PVC-coated nylon, sealed seams, and storm flaps over zippers shield your gear from the elements. Compression straps and tie-downs included. Expansion zipper lets you increase the height of the bag by 10"
Note: This bag is designed for use on hitch-mounted cargo carriers. It should not be used as a rooftop bag. 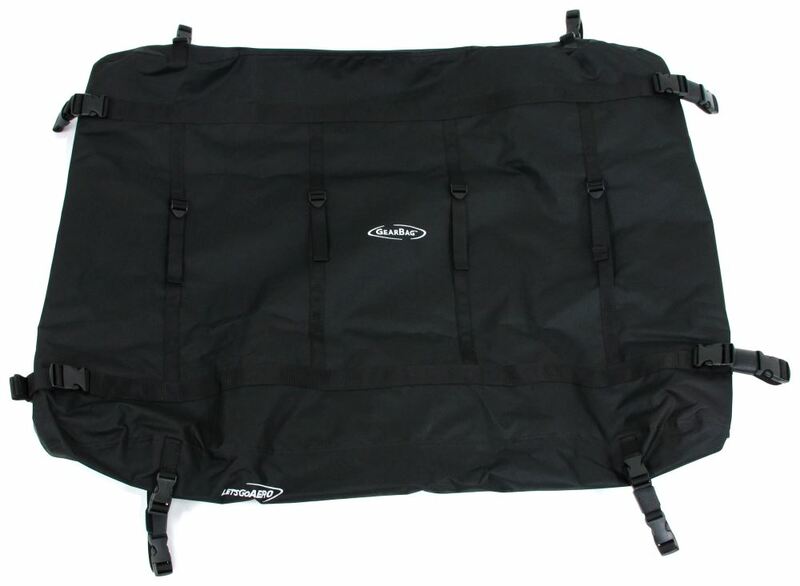 This large, weather-resistant cargo bag holds up to 11 cu ft of gear. PVC tarpaulin material with covered zipper and welded seams keeps your gear clean and dry. 8 Tie-down straps let you secure bag in place. Fold flat for compact storage. This extra-large, water-resistant cargo bag holds up to 20 cu ft of gear. 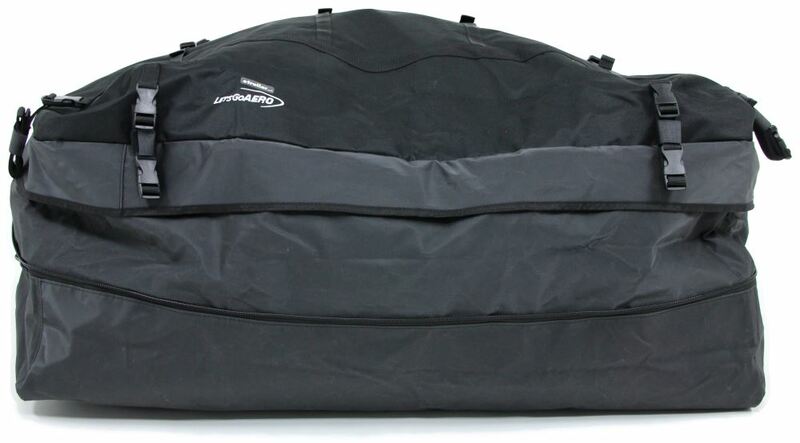 PVC-coated nylon material with covered zipper and welded seams keeps your gear clean and dry. 6 Tie-down straps let you secure bag in place. Fold flat for compact storage. Rhino-Rack Rooftop Cargo Bag - Waterproof - 7 cu ft - 55" x 19-1/2" x 11-1/2"
Rightline Gear Sport 2 Rooftop Cargo Bag - Waterproof - 15 cu ft - 44" x 36" x 19"
Video of GearBag 4 Cargo Bag for GearCage4 - Water Resistant - 20 cu ft - 48" x 32" x 26"
Today we're going to be taking a look at the Let's Go Aero Expandable Cargo Bag for 6 foot gear cages or other 6 foot basket style cargo carriers, part number HCR635. This also available for the 4 foot gear cages or other 4 foot basket style cargo carriers, part number HCR628. 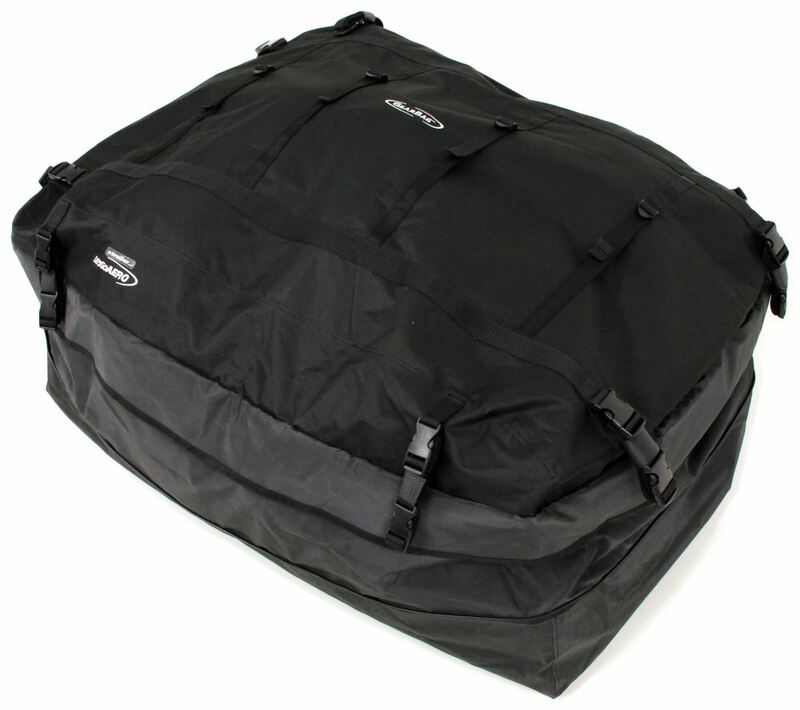 This durable water resistant bag is designed to fit perfectly in your gear cage. It protects your cargo and gear during transport. 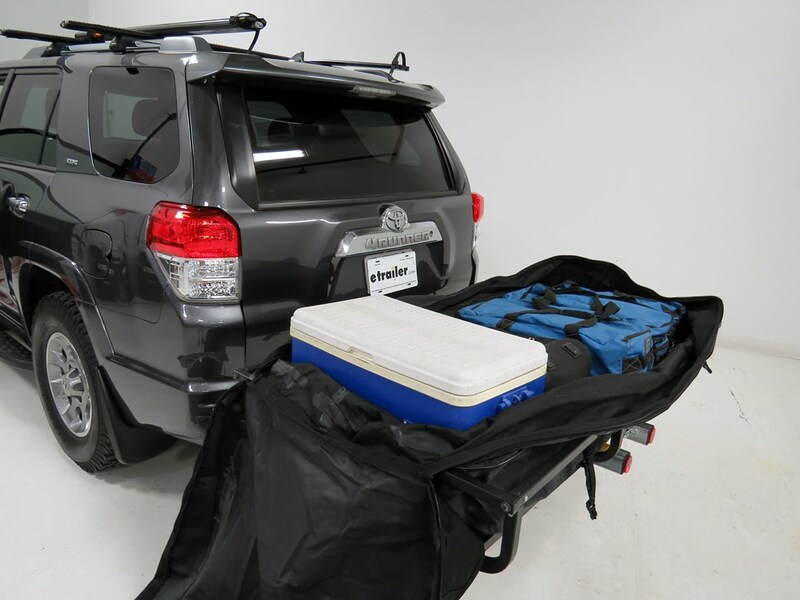 Eight straps secure your cargo bag to your cargo carrier. 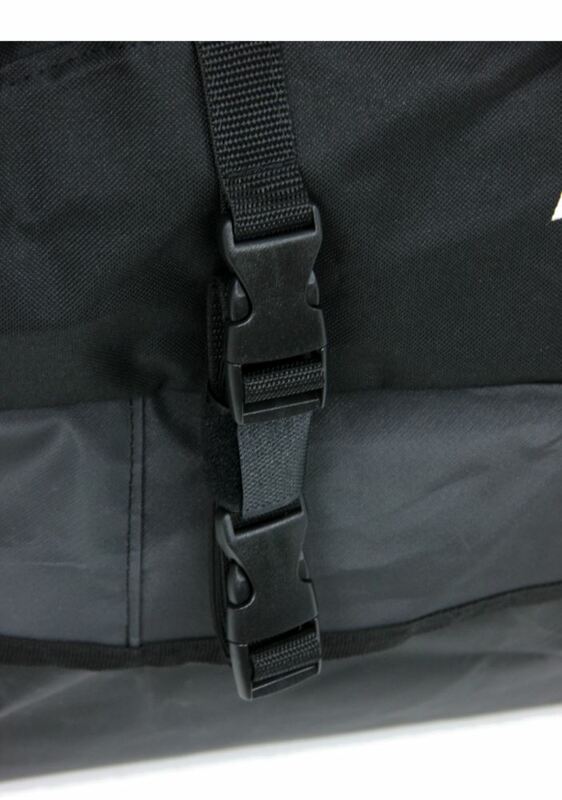 Each strap features a quick release buckle so we can easily gain access to our cargo. k	Our zipper is protected by a storm flap which goes all the way around our cargo bag preventing the elements from getting into our bag. 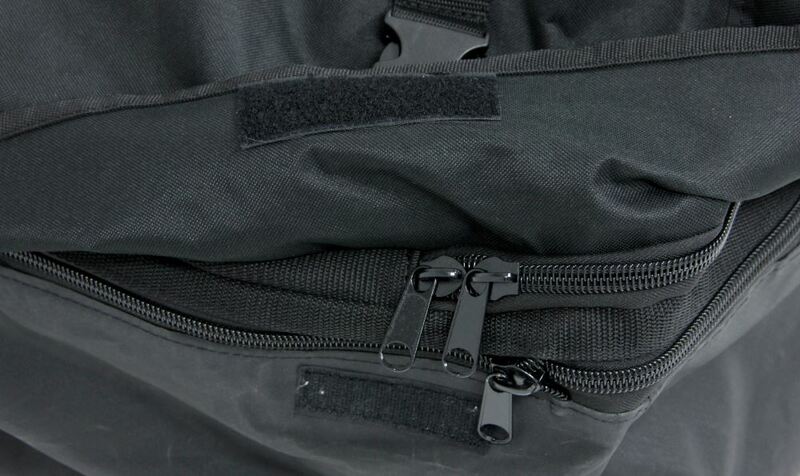 The top of the bag features four compression straps to further secure our gear once we've got it loaded up. 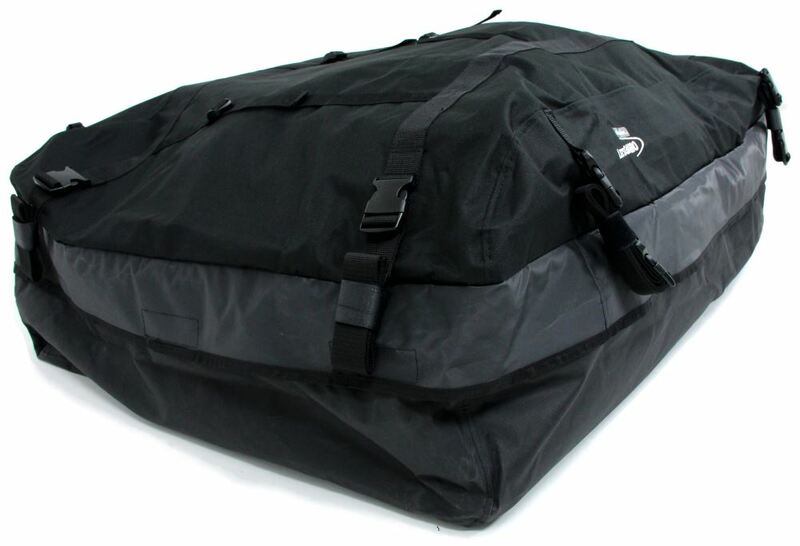 This heavy duty nylon coated bag expands up to ten inches in height and offers us up to 30 cubic feet of space. In order to get up to our maximum 30 cubic feet of space, Let's Go Aero has provided us with an expansion zipper to give our bag more flexibility. When fully expanded, our bag gives us 72 inches by 32 inches wide by 26 inches tall. Now that we've gone over some of the features, I'll go ahead and show you how to use it. First thing we want to do is, we want to go ahead and unfold it and we want to find the logo because our logo is going to face the rear, so we'll just work our way around spreading it out. Once we get it seated, let's go ahead and load it up with some gear. We'll need to go ahead and locate our storm flap on the driver's side here. We've got two zippers, we've got one for our expandable and one that's going to unzip our bag so we can load up some cargo. It will be these two here, which will be the two zippers on the top and we'll just work our way around. Once we get it completely opened up, we can then fold it out of our way and then we can load up some gear. I'm going to take my bags and just going to position them, that way I can make sure and close it up when I finally get it finally loaded. Then we've got just enough room for a cooler. Now we can go ahead and close up our bag and secure it to our cargo carrier. I'll pull it all the way out and get it nice and stretched out, that way we can make it real easy to zip up. I'm just going to start right here and work my way back around, making sure everything's tucked in. Then we can put down our storm flaps, then we can undo our straps and our straps themselves feature a nice hook and loop keeper. That way it keeps them all tidied up and together. With that being done, I'm just going to go around my gear cage here and back up and then I can pull that nice and tight. Once we've got that nice and tight, we can bundle that back up, grab that keeper and keep it all nice and together just like that. Once that's done, we can go ahead and repeat that for the remaining straps. With our straps secured to our cargo carrier, finally we can come up to our compression straps. If we need to further secure our bag, we'll just pull those nice and tight. As you can see, everything's pretty much well kept together and we're ready to hit the road. 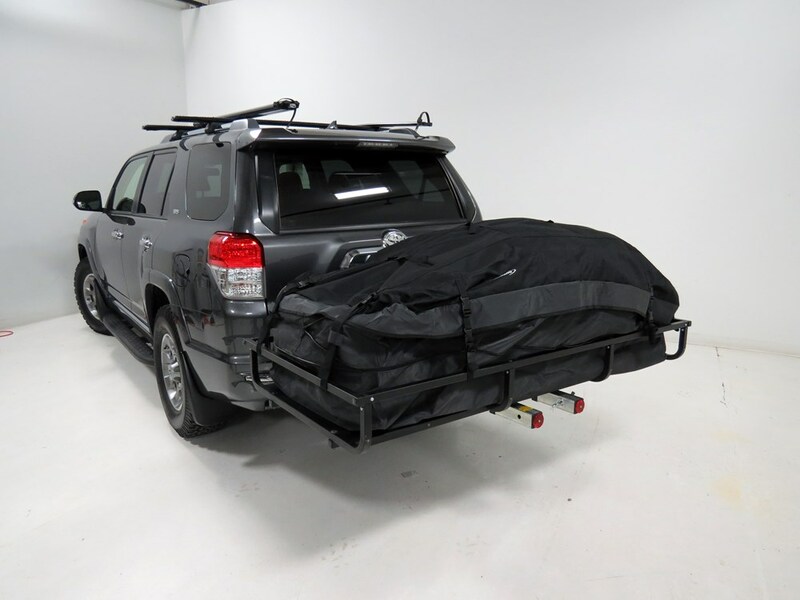 That's going to complete our look at the 6 foot Let's Go Aero Expandable Cargo Bag, part number HCR635. .
Order: RelevanceNewestRating - High to LowRating - Low to High Durable cargo bag fits perfectly into your 48" long GearCage hitch-mounted cargo carrier. Heavy-duty PVC-coated nylon, sealed seams, and storm flaps over zippers shield your gear from the elements. Compression straps and tie-downs included. 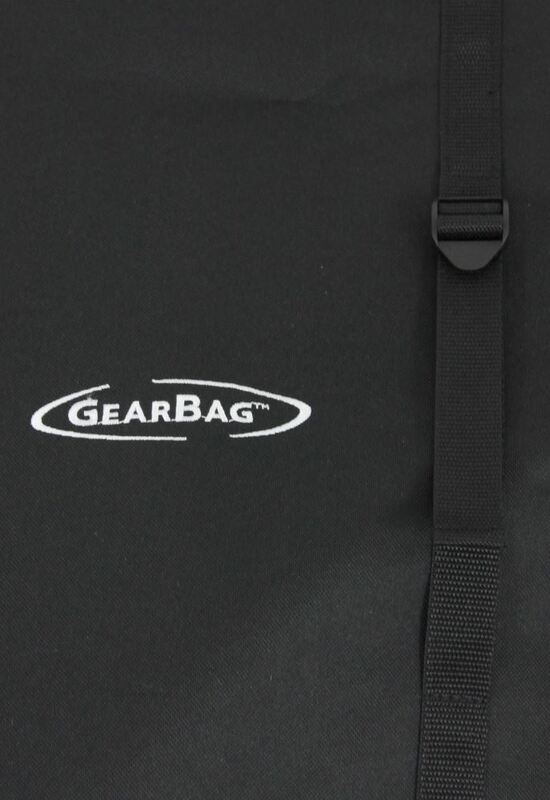 The GearBag 4 Cargo Bag for GearCage4 - Water Resistant # HCR628 is a PVC coated nylon to give you the water resistance and the strong yet pliable durability. It will do better in cold weather than most of the more cost efficient bags like the Rola # 59119 which has the heavy-duty tarp fabric. 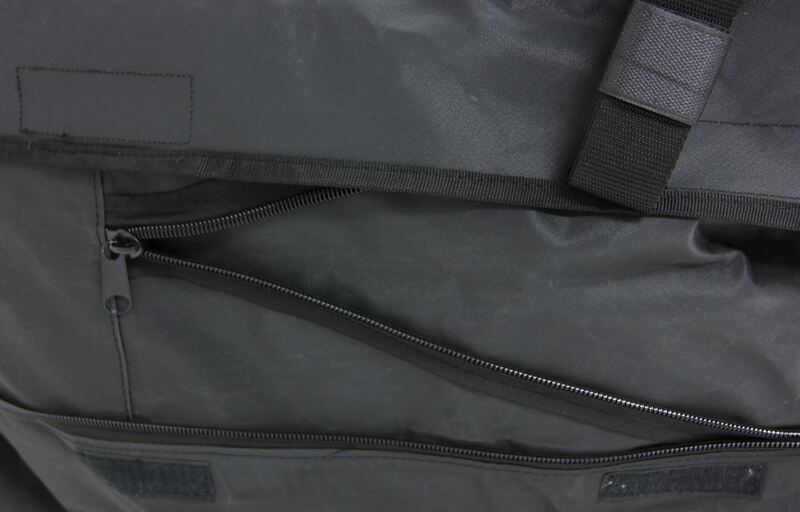 The GearBag 4 Cargo Bag # HCR628 was designed to fit the Lets Go Aero GearCage FP4 # H01380 which has inner dimensions of 48" x 32" meaning that the bag itself will have outer dimensions that match that. If you have smaller chairs, like lawn chairs, then you could turn then diagonally and they would fit no problem.